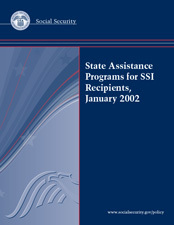 This report provides data on selected characteristics of state assistance programs for Supplemental Security Income (SSI) recipients as of January 1, 2002. The programs are mandatory minimum and optional state supplementation of federal SSI payments, state assistance for special needs, and Medicaid. The characteristics selected for each program are those about which the Social Security Administration (SSA) receives questions most often from individuals, public and private organizations, and federal and state agencies. This edition presents the program details and data in a new format, which is explained in the "Guide to Reading the State Summaries." The report focuses on eligibility provisions and basic levels of assistance for individuals and couples who receive supplementary payments in each state and in the District of Columbia. Payment levels shown are the maximum amounts possible for selected living arrangements. The report also presents information about federal and state administrative responsibilities for making payments, state criteria for special needs payments, and Medicaid eligibility. Sherry Barber of the Division of SSI Statistics and Analysis collected and compiled the data. Laurie Brown edited and produced the report. Wanda Sivak assisted with production. Emil Loomis designed the cover, and Laurie Brown prepared the electronic versions for the Web.